Well, out-of-touch reader who still uses the word “malarkey,” you’re half right. In the political meat grinder that is the June primary, voters hit the polls and sluiced out their favorite candidates, sparing a lucky few from another five months of campaigning and fundraising. Those remaining have until November to woo and sway voters. With the next round getting into full swing, here are a few of the races that will continue to heat up going into November. 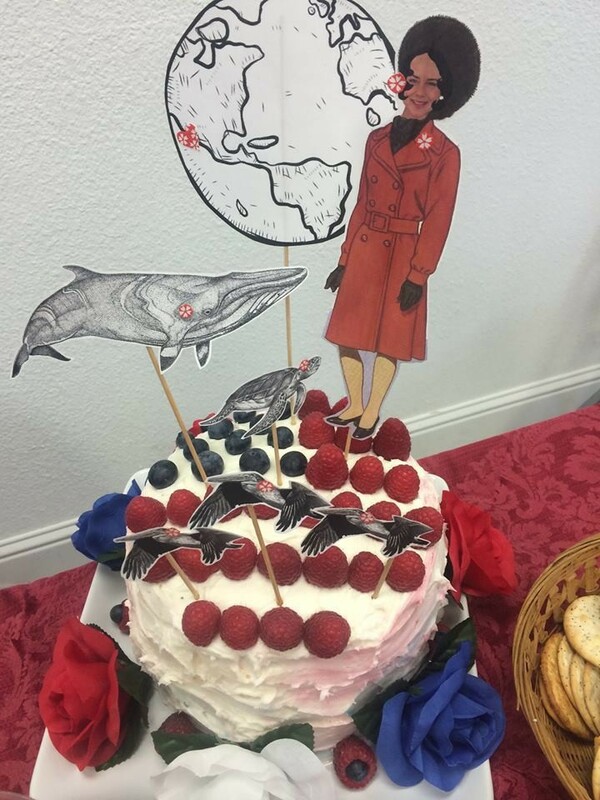 A cake bearing Heidi Harmon’s likeness. Heidi Harmon has a tough task ahead of her, as she plans to unseat a popular incumbent with more than 15 years of political experience in a district that tends to lean Republican. But as of press time, it’s not apparent that she’s flagging at all, which is good because she’ll be spending the next five months waging a campaign against an assemblyman who by all signs has settled comfortably in his seat. State Assemblyman Katcho Achadjian, who represents the 35th District—encompassing all of San Luis Obispo County, Santa Maria, and Lompoc—has handily fended off a few challengers since taking office in 2010. 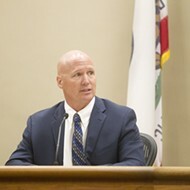 In fact, since the Republican was first elected to the SLO County Board of Supervisors after a tight race in 1998, he’s been pretty much out of reach and enjoyed representing districts with a voter base that leans toward Republicans, percentage-wise. 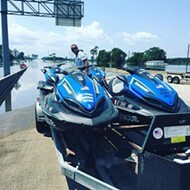 Achadjian brings in a lot of money, is well connected with the communities he represents, and has a reputation for being a likeable guy. Harmon, a Democrat, is after his seat to counter some of that; she hopes to bring attention to the business-as-usual attitude in Sacramento and shake it up. “I think it’s time that we have leadership that puts the long-term viability of all of us over the short-term economic gains of a very few,” she said. Harmon is best known as a passionate climate-change activist—holding leadership roles for local chapters of the Sierra Club, 350.org, and Citizen’s Climate Lobby—and has made that a centerpiece of her campaign. She’s also pulled from a variety of broad social issues that include minimum wage, reproductive health and women’s rights, immigrant rights, public health, and bolstering small businesses. The climate-change angle has many of Harmon’s supporters excited, after what they’ve seen as a sluggish response from lawmakers as record temperatures continue to mount and occurrences of drought and wildfire are exacerbated by dry conditions, which Harmon says will bring the issue to its boiling point. She’s focused on buoying progress toward renewable energy and disincentivizing continued fossil fuel production. While Achadjian has made some plays favored by environmentalists, including a vote last year against hydraulic fracturing, he has both private and political ties to the oil business and has attracted thousands in campaign contributions from fossil fuel industries. But he said his constituents always come first. Achadjian received 65.3 percent of the vote in the June 3 primary, giving Harmon only a taste of what she’ll be up against in November. “It’s not just me running against the Assemblyman; it’s all the people that care, it’s all the people that want to get money out of politics, it’s all the people that want to restore a democracy,” Harmon said. Election night in SLO County: Vote counters included Tommy Gong, candidate for SLO County Clerk-Recorder. Members of Congress have their hands full. Aside from managing the budget of an economic juggernaut, wrestling with hot-button and divisive issues, playing world police, and dealing with never-ending partisan gridlock, they also have to run a campaign for reelection every two years. Congresswoman Lois Capps of California’s 24th District has seen a variety of challengers come and go during her 16 years in office. Chris Mitchum is the latest contender, having come through the primary and heading toward the general. Mitchum’s plan is twofold: Stand firm on Republican ideals, and take the battle right to his opponent. Key points include keeping taxes low and the government in check, letting the market do its thing, maintaining a “peace through strength” posture abroad, and securing the border (by deploying military veterans). Mitchum considers these views fundamental to what makes him a textbook conservative Republican, a description he embraces. Mitchum previously made a go for the state Assembly and for Congress, but he’s never been elected to public office. In this election, he lists his experience as a Screen Actors Guild (SAG) vice president. “I kind of have the same background politically as Ronald Reagan,” Mitchum said. Reagan served as SAG president in the 1960s, before he was elected California’s governor. Mitchum served as a VP in the late 1980s. After the McCarthy-era blacklisting, Mitchum said he was caught in the subsequent “liberal Hollywood” blowback and was “blackballed” because he’d shared a screen with his friend John Wayne—not shy about his patriotism—and had to resort to taking roles in Asia. Even as the campaign’s narrative continues to be an ideological clash between political parties, Capps highlighted the ways she’s worked in nonpartisan and collaborative ways. High on Congress’ current agenda is comprehensive immigration reform, which Capps suggested Republicans have weighed down with obstructive ideological posturing. Capps disagreed with that assessment. “In terms of just California, there are about 3 million Californians now that now have access to health care—when they didn’t before—that may disagree with Mr. Mitchum,” she said. With his sights now set directly on Capps, Mitchum is promising a fiery campaign. Coming into the June 3 primary election, the race for the District 4 seat on the San Luis Obispo County Board of Supervisors was an important, expensive enigma. Despite more than $400,000 in total campaign contributions, six public forums, and significant media attention, nobody really knew how Lynn Compton, Caren Ray, or Mike Byrd would fare in the battle for what many consider to be the “swing seat” on the board. 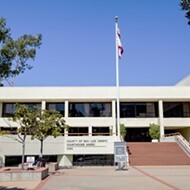 June 3 marked the first contested election for public office for Compton, Ray, and Byrd, and—since polling was prohibitively expensive—all of the candidates eagerly awaited the election night returns to assess their campaigns. Ultimately, the vast majority of the vote went to Compton (the top fundraiser and mainstream conservative candidate) and Ray (the incumbent supervisor and mainstream liberal candidate), pushing Byrd out of the race. As of June 10, the election percentages stand as follows: Compton with 47.3 percent, Ray with 41.7 percent, and Byrd with 10.8 percent. Since none of the candidates garnered 50 percent of the vote, Compton and Ray will advance to a runoff in the November general election. 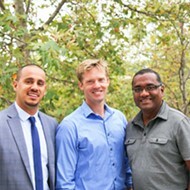 Speaking with New Times a few days after the June 3 election, both Compton and Ray were pleased with their performances in the race’s first round, and both predicted a fiercely fought second round later this year. Compton has been the race’s top spender and fundraiser thus far, garnering a total of $195,415.22 in monetary contributions, loans, and nonmonetary contributions from the race’s outset through May 17. Ray collected $140,549 in the same span. There’s no love lost between Compton and Ray, and—when asked about her November strategies and why voters should pick her—Compton was very frank. When pressed for details, Compton said Ray has raised local taxes and fees, increased government spending, and hurt the local job market during her time as District 4 supervisor. 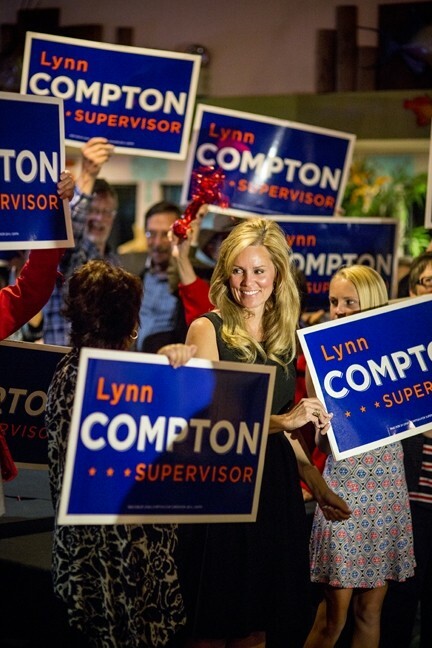 Compton said voters should vote for her because she holds the business experience and small-business-friendly policies that are needed for economic prosperity in South County. “I am going to advocate for the little guy, who is currently getting squeezed out, and that’s why people should vote for me,” Compton said. Unsurprisingly, Ray disagreed with Compton on almost every point. Ray said she was undeterred by coming in second, and added that she considered picking up almost 42 percent of the vote in a three-way District 4 race to be a significant accomplishment. When asked about her predictions for November, Ray compared the District 4 race to the parable of the tortoise and the hare. “[Compton] is the hare, coming out spending all that money with guns blazing, but we’re getting our message out, and slow and steady will win the race,” Ray said. Ray said that South County voters should support her because she is the only candidate with government experience, has a proven moderate track record, and has an inclusive and substantive message. When asked about Compton, Ray didn’t mince words either. Ray said she plans on reaching out to as many voters as possible between now and November to deliver her issues-based message while also looking to emphasize the differences between the two candidates. It’s pronounced “mah-koe-wet-ski,” and get used to saying it, because newcomer Matt Makowetski is the newest member of the Morro Bay City Council. For the partygoers packing Morro Bay City Councilwoman Christine Johnson’s home on election night, the results couldn’t have been more perfect. Early in the night, lifelong resident and high school English teacher Matt Makowetski reached the 50 percent plus one vote he needed to earn a seat on the City Council, and his share only grew. Mayor Jamie Irons, who recently withstood a recall effort by some residents, also commanded a healthy lead and ensured he’d have another two years in office, beating out challenger Carla Wixom. And the other two candidates will have to duke it out in November. After weathering a failed recall effort, Jamie Irons won another term as mayor of Morro Bay. 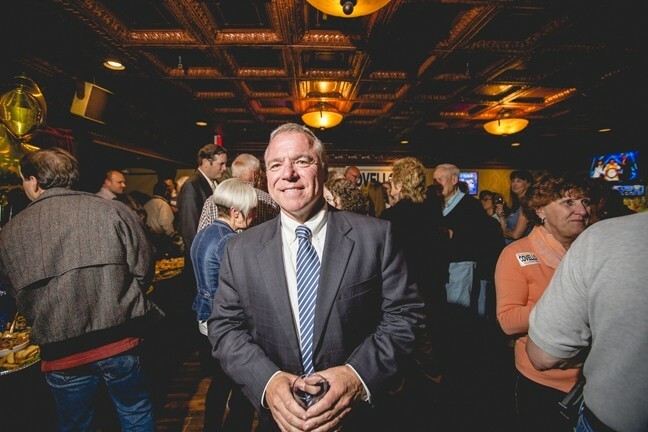 While Makowetski and Irons settled into the comfort of a successful campaign, the battle for the remaining seat waged on, and by the end of the night, partygoers got exactly what they had hoped for: another term for Irons, a new face to replace outgoing Councilman George Leage, and a runoff for the two remaining candidates. As of press time, the County Clerk-Recorder showed that incumbent Councilwoman Nancy Johnson received the lowest share of votes, while challenger John Headding was tracking just shy of the 50 percent plus one he needed to gain the seat. Morro Bay’s election system is confusing—the vote is tabulated in June with the possibility of a November runoff—so some local media wrongly reported that Nancy Johnson had been ousted. It’s an archaic voting system, according to supporters who attended Irons’ and Makowetski’s election-night party, and likely something that will be phased out in the future (the system was put in place under a 2006 voter initiative). 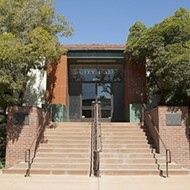 In fact, Morro Bay is the only city in the county that has a two-election system to determine City Council seats. And the city continues to foster strong ideological divisions, with much of the animosity directed toward Irons. In the final days of the campaign, a number of his supporters told New Times they’d been met with “choice words” while walking precincts and middle fingers while driving through town. Heading into November, Nancy Johnson will be crunching numbers. Makowetski’s victory leaves potentially 2,374 votes that went to him on June 3 now up for grabs out of 6,806 registered voters. Headding is largely considered as falling into the political middle ground; Johnson has often firmly defied the three-vote majority of Irons, Christine Johnson, and Noah Smukler. This photo was taken as the first results came in, showing that incumbent Morro Bay City Councilwoman Nancy Johnson received the least votes of three candidates vying for that seat. Nancy Johnson didn’t respond to requests seeking comment. Headding, who’s focused his campaign on the long-term city budget as stagnant revenues fall behind increasing expenses, said he doesn’t consider himself aligned with any one group or political cause. For voters in San Luis Obispo, how they feel about one box on their ballots will undoubtedly impact the others. Two seats on the City Council are opening to challengers, as is the mayor’s seat. 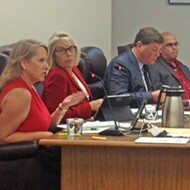 Councilwoman Kathy Smith announced early this year that she wouldn’t seek reelection, while Carlyn Christianson will face at least three other potential candidates as she vies for another term in office. As of press time, Mayor Jan Marx had filed to run for her seat again, and was unopposed. Voters will also get to decide whether to renew Measure Y, the half-percent sales tax initiative. While Measure Y hadn’t officially been added to the ballot as of press time, at least four sitting councilmembers indicated they’d put a proposal out to voters. With 100 percent of precincts reporting their candidates had won on the night of June 3, supporters burst into cheers during an election-night party for Jamie Irons and Matt Makowetski. Christianson, on the other hand, credited Measure Y funds with stemming a crisis in the wake of the 2008 financial crash. Two other candidates—firefighter Kevin Rice and county Planning Commissioner Eric Meyer—previously filed to run but have since dropped out of the race. The remaining candidates will also likely be expected to address the issue of a new dorm proposed for construction at Cal Poly, though the location has raised protests from nearby residents. 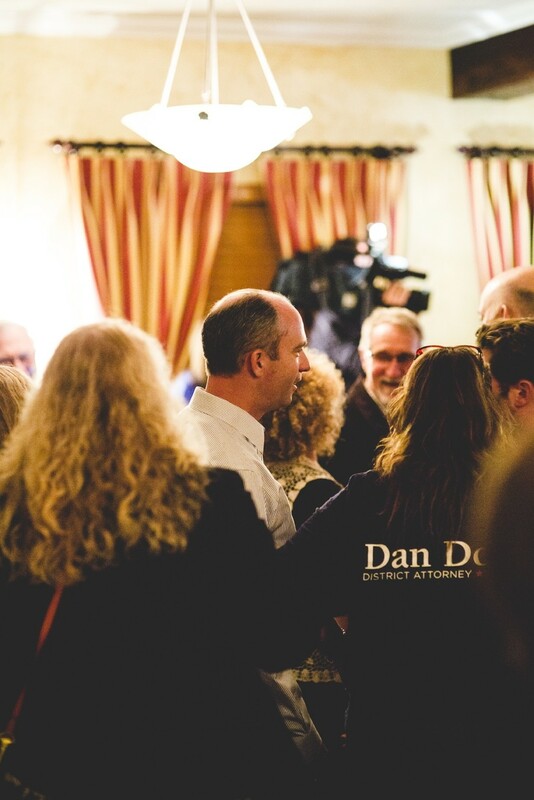 After roughly six months of fierce campaigning for the office of District Attorney, Deputy District Attorney Dan Dow took home enough votes to replace outgoing District Attorney Gerry Shea in 2015. As of press time, Dow had garnered 30,371 votes, which gave him 53.84 percent of the 62,012 votes cast, according to the SLO County clerk-recorder. Despite the heated campaign between Dow and Assistant District Attorney Tim Covello, Dow said he’s “not going to hold a grudge,” adding that he plans to work with Covello and Shea to transition the office, which Shea has held for 16 years. 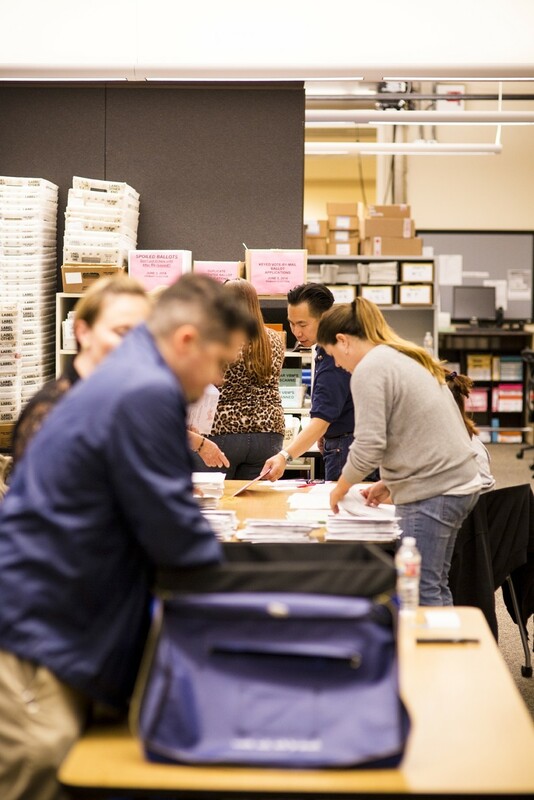 In the race to succeed longtime SLO County Clerk-Recorder Julie Rodewald, candidates Tommy Gong and Amanda King proved themselves to be fairly evenly matched. As of June 10, Gong had nabbed 45.8 percent of the vote, and King had collected 43.2 percent. Since neither candidate received more than 50 percent of the vote, Gong and King—both of whom currently work in the Clerk-Recorder’s office under Rodewald—are headed to a runoff in the general election in November. Send comments to Managing Editor Ashley Schwellenbach at aschwellenbach@newtimesslo.com.